Visakha Vidyalaya and St. Joseph’s College headed the points table with 156.50 and 189 respectively at the 44th Sri Lanka Schools Swimming Championship s second day morning session events held at Sugathadasa Swimming Pool Complex yesterday. In the second day morning session events four new meet records were set up. Pinsara Sadaham of Sussex College created a record in boys under 9 50m Breaststroke event by clocking 44.34 seconds while Royalist Banuka Jayathilaka set up a record in under 13 50m Breastroke event. In the girls under 9 100m freestyle event K.U.O. Onanga of Sumedha College, Gampaha established a new record by clocking 1:21.44 minutes. 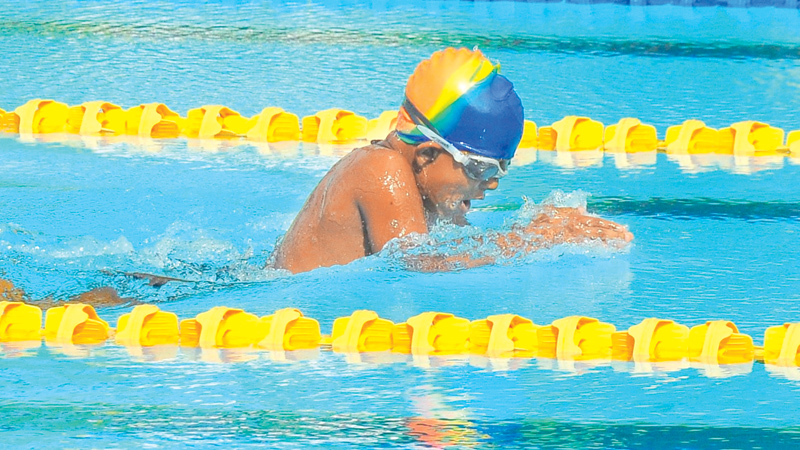 Bihandu Hansana of Sri Devananda College set a record in boys under 11 100m freestyle event by clocking 1:07.19 minutes and he also sets a new record yesterday (30) in 100m backstroke event. Lyceum International School, Wattala secured second place in the points table with 145 points while last year champions Mahamaya College, Kandy became third with 136 points in the girls category. In the boys category Royal College and St. Sebastian’s College secured the second and third places with 116 and 83 points respectively. Lyceum International School – Wattala and Nugegoda had the highest combined team scorers with 211 and 130 points respectively while Gateway International College were in third place with 53 points.